The goal of our classes is to foster a strong, positive bond between dogs and their owners. Through these classes, we strive to promote humane education, responsible pet care, and dog training based on positive motivation. All animals, regardless of class option, need to be registered BEFORE coming to class. Classes run from August - Dec and Jan - June. See below for specific dates and/or session information. Direct questions to obedience@hinsdalehumanesociety.org. 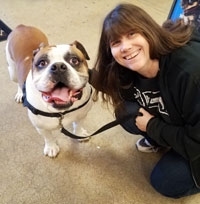 Deborah Plowman, an accredited dog trainer, uses positive training methods in her classes to make training fun as well as to help build a positive relationship between dog and human. Deborah would like all dogs (and any animal) to be happy in a forever home for their entire lives no matter how they arrived at that home. She believes that a strong human-dog bond should be based on trust and the best way to do this is through education and training. You will hear her say that we can spoil our dogs, but they need to be well trained and have manners. Deborah mentored under Kym Iffert as well as trained separately for many years. She is a member of Association of Pet Dog Trainers and is a certified AKC Canine Good Citizen evaluator. She has volunteered at different shelters and continues to help enrich the lives of dogs and their families. Once you have registered, you will be given a link to complete the Dog / Family Profile. This profile must be completed prior to your first class. The class is open to all dogs adopted from HHS and non-aggressive dogs from the community. Proof of current rabies vaccination is required. Family members over the age of 5 are welcome and encouraged to attend. If your dog is under 4 months, we recommend a puppy kindergarten as a prerequisite. Start your puppy out right by focusing on the behaviors you want, rather than struggling with what naturally comes to our 4-legged friends. A 6 week open enrollment class introduces your puppy to safe socialization with people, household manners, proper handling techniques, focused attention and basic obedience commands while safely interacting with other dogs both on and off leash. This fun, interactive class will help you understand and successfully navigate typical puppy problems including puppy nipping, housebreaking and crate training as well as proper health and nutrition and exercise needs. Requirements: Puppies must be 8-14 weeks at the start of class and have proof of current vaccinations & deworming. This class takes your well trained dog from being told what to do and turns him into a thinking dog who can figure out what he needs to do in order to score the reward. We review the skills learned in Family Dog Obedience Class and add more depth by introducing distractions and new concepts that can give you and your dog the skills to consider Canine Good Citizen or Therapy Training. We cover recalls, sit stays, go to your place, greeting people and other dogs while on leash, loose leash walking and impulse control exercises. Registration is on a drop-in basis. Our puppy social time (playtime) is designed to allow your puppy to have safe, off-leash playtime with other puppies during a critical social development window. This 45 minute session provides puppies 10 weeks to 6 months old a fun environment to learn social skills. Our trainers will lead the playtime using their expertise to teach your puppy how to play appropriately with others while also teaching you what is normal and appropriate puppy play. Requirements: Proof of current vaccinations required. Price: $10. Payment is onsite. Watch for next registration date. This class is designed to prepare the dog and handler for the CGC test which includes 10 test items which will be discussed and practiced throughout the duration of this 6 week class. Requirements: Dogs appropriate for this class will have needed to attend an intermediate obedience class (unless approved by instructor). Refunds for these classes can only be offered if cancellation notice is given a minimum of 14 days prior to the beginning of class. Please note: Starting with the January 2019 sessions, all classes will be held at our Pet Rescue and Resource Center, 21 Salt Creek Lane, Hinsdale. For safety reasons, children under the age of 5 may NOT attend. Children 5 to 16 years of age must be accompanied by an adult. *At no point will any type of metal collar or” flexi-leashes” be allowed for use in class.